What Does Metairie Office Space Lease For? Your commercial property is not worth the appraisal it was written on. That’s because an appraisal looks at past prices and your property is worth what a qualified and motivated buyer will pay today, depending on his use of the property. It has little to do with past purchases and uses. That’s why a vacant hotel on Canal Street appraised for $9 million and will sell for $4 million. Buying, selling or leasing Commercial Real Estate is not like buying a stock where there is a published price, with many buyers and sellers creating a competitive market. Market prices can also be widely different from appraisal valuations. That is why knowing current price trends can help you make better decisions on Commercial Real Estate. The chart below shows prices of office property in various markets, ranging from state to Metropolitan Area, County (Parish) to City, and shows the change in prices from 2006. That way, you can derive an opinion of the trend in prices, in your location, in the property type that interests you. Office space for lease is priced per square foot and calculated as an annual expense, so you need to know the square foot of space involved. The typical office is 10 feet by 12 feet. If you are leasing three offices, that is 120 square feet per office, totaling 360 square feet; however, also included can be hallway and restroom calculations. And that is just for the space you use. There is also an added charge for common space, called CAM. For example, if office rents in Metairie average $17.31 per square foot, and you rent 1,000 square feet, the total annual rent is $17,310, or $1,442 per month. CAM charges could easily be $2-$5 per square foot extra. 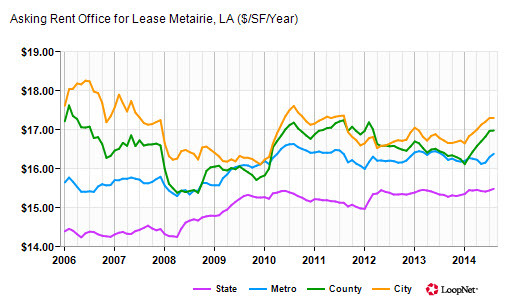 The table below shows the change in lease rates for office property in Metairie, compared to the Parish, New Orleans Metropolitan Area and Louisiana, for the last 3 months and year to date. The Metairie area and the parish have seen prices increase for office property faster than the state average and much faster then the New Orleans area. For more information on office leasing including CAM charges, read our article Office Market Trends. For an FREE analysis on your commercial property or help leasing office space, contact Louisiana Commercial Realty at 504-289-8172.